Click on the Images to watch the Video. 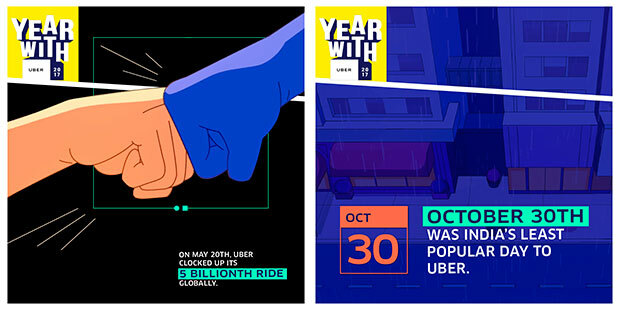 Uber has launched a new campaign titled #YearWithUber in association with R/GA Singapore once again. 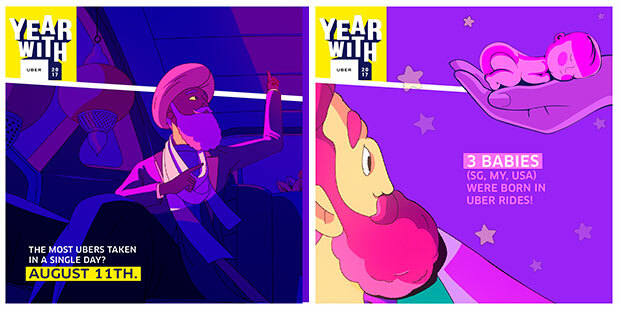 Together, the two partners have launched a website www.yearwithuber.com that offers each rider a personalised look back of the year’s journey with Uber. 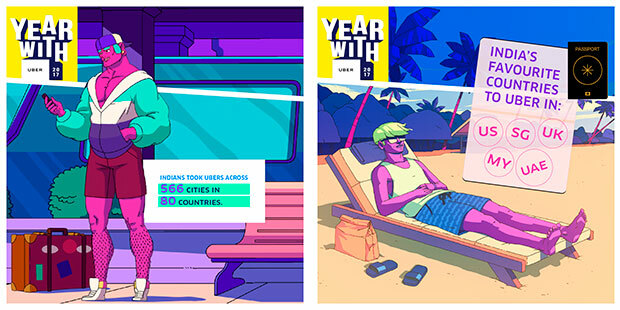 Last year, Uber had launched a review of the year which was more region-specific. 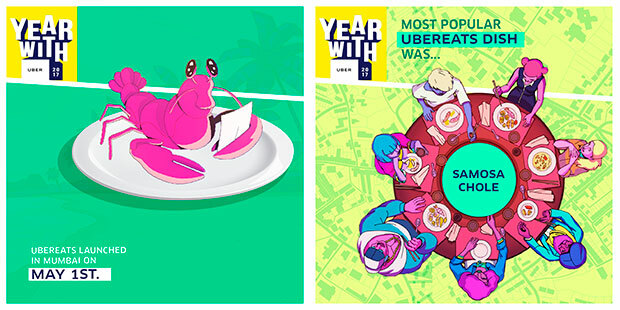 This year, the cab aggregator company announced the interactive and shareable visualisation of the way people moved across cities in 2017. Uber India had recently launched its first television commercial (TVC) titled #ApniHiGadi, which was conceptualised and implemented by Taproot Dentsu. 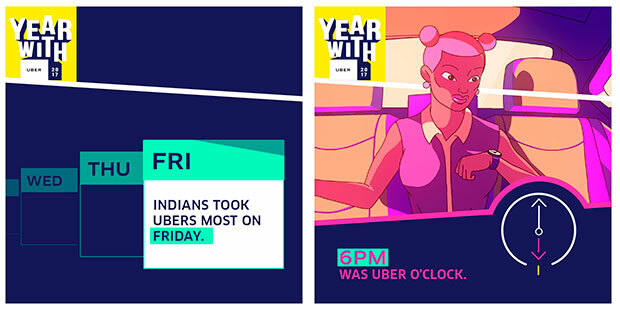 The new initiative was launched across Asia-Pacific and turns trip data into personalised, animated music videos, bringing to life memorable moments from Uber trips for the past 12 months. A multitude of region-specific locations, scenarios and characters were designed, alongside an original soundtrack with a modular composition, allowing seamless splicing with visuals. With over 5,000 possible story and song combinations, there’s bound to be a unique retrospective Year with Uber music video for every rider. “Capturing the nuanced use of Uber in different markets was as integral to the project as the tech that powers it,” said Laurent Thevenet, Senior Technology Director, R/GA Singapore. The result is a stylised reflection of the cultural melting pot that is Asia Pacific, with instantly recognisable elements incorporated into visuals and lyrics. Users in Thailand will see tuk-tuks, while their Singaporean neighbours encounter elaborately coiffed tai-tais (wealthy aunties); for Aussies, the iconic Melbourne Cup and Sydney’s New Year harbour fireworks will be a highlight, while in India the national sport of cricket gets a run. Local festivals and holidays also serve as highlights, including Ramadan, Christmas and Deepavali. Outside India, the experience is available for users in Australia, New Zealand, Hong Kong, Indonesia, Malaysia, Philippines, Singapore, Thailand, Taiwan and Vietnam.